In 1998, we were selected through a design competition, to be the preferred landscape architect for future developments at the University of Canterbury campus. The campus master plan, prepared during the competition, aimed to build on the attributes of the campus while creating a strong sense of identity and place. The plan and subsequent landscape design also recognise that the campus is a public realm used by diverse student, staff and visitor groups and must reflect an understanding of usage patterns and specific user requirements. To date, we have designed the redevelopment of three major areas in the campus – the North Arts Lecture Theatre area, the Science Precinct and the Library Plaza – and overseen their implementation. We have also been advisors and supervised the construction of a number of smaller-scale projects. created destination areas that reflect the unique identity of the campus. The Science Precinct surrounds the Science Lecture Theatre building at the University of Canterbury. Boffa Miskell’s landscape design aimed to respond to existing attributes of the area such as the character of native planting and Modernist Architecture as well as provide for pedestrian movement and seating. Islands of botanical plant groupings were established in consultation with the University Botany Department. The form and layout of these plantings are ‘biomorphic’ in appearance, reflecting cell morphology. Boffa Miskell developed the landscape concept through to design documentation, and administered the implementation maintenance period. Campus life is as social as it is academic for many students; meeting new people, exchanging ideas and participating in the buzz of university life. 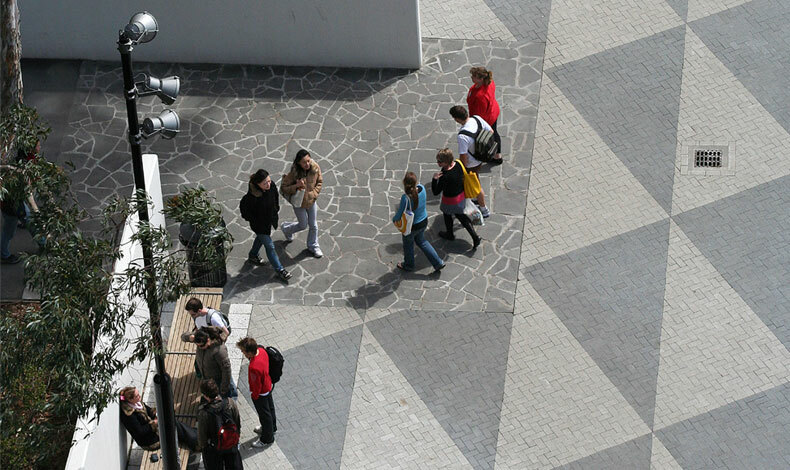 This social dimension was central to Boffa Miskell’s winning entry in the 1998 University of Canterbury’s campus landscape redevelopment competition, which is being progressively implemented. The concept aimed to improve opportunities for social interaction by creating attractive mingling places for students. The recently completed Library Plaza, for instance, is the main central outdoor space on campus where students from all faculties come and go. It has been redesigned as an uncluttered ‘outdoor’ room to accommodate both casual socialising and formal gatherings of large groups for occasions such as political addresses. Campus legibility is also being improved by developing a series of easily recognised promenades, defined entry points and focal plazas. Campus master planning, landscape design, supervision and contract management of site works.